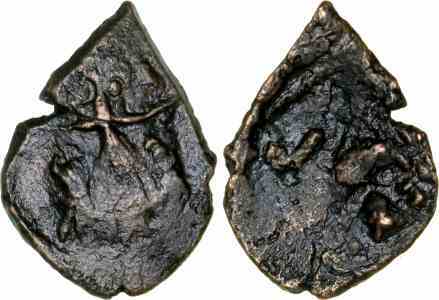 Bronze decanummium, 14mm, 1.3gm, issued AD 641-668. Constantinople mint. Obv: Bust facing with long beard, wearing crown and chlamys, in field. Rev: Large I between numerals representing the regnal year (on left), and officina (on right), above cross. References: DO 98, Sear 1021.